My very first book, written back in 2004, was a book about the Tablet PC and it sold well. I don’t advise you to buy that book now since it’s horribly out of date, but ever since writing it I’ve been watching the tablet space and yearning for the perfect productivity tablet—one that is good for play and work. In particular, one the can run a full copy of Outlook. We are getting close, but are we there yet? In one case, I think we are. But for me it’s not Microsoft’s new Surface Pro as many had hoped; rather, at the moment I think it’s the Lenovo Thinkpad Tablet 2—another new Windows 8 Pro device. More on that choice ahead. What is a Tablet, Really? First, to identify the perfect productivity tablet we need to ask, What is a Tablet, really? The specs of the basic tablet have been shifting over time, but if you define a modern tablet simply as something akin to the latest iPad, I’ll agree with you—the iPad design represents the incumbent design to beat. And what makes it that? It’s a handy media consumption device that, as a bonus, comes with some real-work capabilities. So that means it’s good for surfing the web, reading a book, and watching videos; and it’s also good for doing light e-mail and document work. And it has lots of apps. There are Android tablets that match this too. That latest tablet ideal is also defined by its form factor—its size, weight, and battery life. It’s thin and light enough to hold easily in one hand while reading a book or browsing a long web story. And the battery lasts long enough to not need to stay plugged in while using it for a while. This last point—battery life—is important. You should be able run out the door with it and not worry about it being nearly dead from its last use. You don’t want to have to keep it plugged in while using it to cover short hops away from an outlet. And the iPad fits all this perfectly, which explains its amazing sales success. But how can we do better than an iPad? The next killer tablet platform should have nearly all that the iPad has and, of course, even more. And the “more” in this case, for me, is the promise of a tablet that better morphs into a true work device for the (usually short) periods when I need it to. I don’t want it to replace my 13-inch laptop, but I want it to cover me for work tasks when my laptop or desktop is not handy, or when pulling a laptop out is just not warranted. As I’ve said before, a true tablet (as defined above) will never be your main work device. No matter how powerful it is, the tablet form function has just too small a screen and keyboard to ever feel good for longish computer work. For that reason, if you do lots of computer work you should always plan on toting a lightweight laptop AND a tablet on your business trips or even your trips between home and office. Use the laptop for real work and use the tablet for quick e-mail access, mobile reading, browsing, and some light work. But that said, when using my iPad I am consistently wishing it could do more real work. Why? Because, since it is so portable, I am more likely to have it with me than my laptop. For example, I am much more likely to carry my iPad into a restaurant than my laptop. I am much more likely to stick it under by arm or in my tote bag when I go to a non-business event. And because of that, my iPad is much more likely to be with me when I suddenly encounter an unexpected work task to do. And so I wish my iPad were more powerful when I get that random call from the client requiring me to edit and resend a complex document. Or when I need to do a complicated file search for an item someone just asked me for. Or when I need to use specialized software that only runs on my PC. My next tablet needs to be able to do those things in a pinch too. And that’s the promise of the new Windows 8 Pro tablets. Along with the nimbleness of a tablet, your entire work life is there, under your arm, when you need it for quick, real work. Not necessarily a full day of work; but definitely for short-term work. Tablets are just too small to do serious work on them all day. But still, whenever I need power, wherever I am, I want it to be able to do it, and I can with a Windows 8 Pro tablet. Note of course that the first Surface release—Windows 8 RT—does not have this; it gets a little closer, and so it is a nice next step. But it lacks too many PC functions to fully meet the promise. It’s comparable to an iPad in functionality (though missing lots of iPad-like apps), and it goes just a bit beyond the iPad since it runs Word, PowerPoint, and Excel. But only a Windows 8 Pro tablet really promises a significant step up from the iPad in terms of being a real work device. But do Windows 8 Pro tablets fill that promise? The answer is “it depends.” With current hardware, it comes tantalizingly close. In fact, one hardware version really is there if you accept some compromises. But unfortunately, the main Pro device (the Surface Pro) does not meet the promise. First, after using one for a few weeks I’ve decided the Microsoft’s Surface Pro tablet is not the Windows 8 Pro tablet solution that I need. Why not? Because of its horrible battery life and its heavy weight. Let’s talk about its Battery life. It is advertised at 4.5 hours; but real-work lab testing often shows 3.5 hours or less, and I feel like I often get as little as 3 hours on mine. Its battery life is short enough that for me it creates the “dead-battery-fear factor” I so hated in my old laptops. That’s the fear that unless it’s fully topped off when I leave, I won’t get through a full plane flight or a long sequence of meetings. It’s the fear that if I don’t immediately plug it in when I get back to a socket it won’t even make it through a restaurant meal the next time I grab it and run out the door. So, like my old laptops, I want to keep the Surface Pro plugged in all the time, even when I am actively working on it, to ensure it is ready for the next time I run away from an outlet. That worked okay with my old laptops, but it does not work at all with a tablet. Why? Because I used the laptop sitting at my desk and my desk has an outlet handy. But I don’t use a tablet mostly at my desk. Rather, I move my tablet all over my home or office, and so keeping it plugged in most of the time is not practical. Which means it is often not charged enough when I want to grab it for a longer meeting or meal. I keep finding it with less than an hour of life, and it often dies on me in the middle of a task. Sure, I could plug it in more. But keeping it plugged in everywhere I go just feels wrong—it’s not the iPad experience I am used to. It’s amazing what a difference an 8 to 10-hour battery life makes and it’s amazing how debilitating a 3 hour life really is. That’s why I think the Lenovo ThinkPad Tablet 2, with its 8 to 10-hr battery life and 1.3 pound weight, is essentially it for me, for now. It’s a 10-inch, iPad-like media device that, since it runs Windows 8 Pro, can extend to full work capabilities when needed. It has access to all my main software, especially Outlook. With IE and Firefox on the desktop, it runs all the browser add-ins I need for work. And those special one-off PC programs I use run just fine on it. I’ve been using one for a week now, and it is a delight to use. I don’t even touch the Surface Pro anymore. One bonus is the Lenovo costs about $250 less than the Surface Pro. It does have compromises, but they are not what you might think. First of all, surprising, the compromise of the Lenovo ThinkPad Tablet 2 is not really in its low-power Atom processor. Sure, any tablet with an Atom processor is slower than the Surface Pro with its i5 processor. I notice the slower speed, but it’s not bad; it works well enough for the short desktop PC-software work spurts I need it for. I wouldn’t do video editing on it or plan a full day of regular work on it. But remember; I’ll still have my laptop with me for extended business trips or work efforts. My tablet just needs enough PC power to keep me covered for short-term non-tablet work tasks, in between my regular tablet usage, and this unit does that. And the Atom power drives the tablet functionality well—that’s what I use it mostly for (web browsing, light e-mail, other apps). In fact, I find it comes out of sleep mode a lot faster than Surface Pro does. The lower-power processor is what enables the longer battery life. With 8 to 10 hours it lasts just like an iPad. With that battery life I am confident to stick it under my arm and run to a restaurant, a meeting, or even the airport, not worried that I forgot to keep the battery topped off. And the lower RAM and storage the Lenovo has, compared to the Surface Pro (2 GB vs. 4 and 64 GB max vs. 128 max), has not bothered me either (surprisingly). I seem to have enough for the desktop programs I use (the entire Office suite)—I have not met a barrier yet. Most importantly, Outlook runs just fine on it. But the most amazing thing is its incredibly light weight. At 1.3 pounds and .34 inches thick, the Lenovo is even lighter than any of the 10 inch iPads, and it feels thinner. It’s amazing how light and thin this unit is. I am consistently reading with one hand, scanning webpages one-handed, taking notes, and so on. It feels more tablet-like than even my iPad or Surface RT. It reminds me of a Kindle in terms of handling. No, the main compromise, if you call it that, is a keyboard. I deeply wish it had a keyboard cover just like the Surface. I love the Surface keyboard cover, how it’s always there when I need a bit more typing power, and how it flips out of the way when I don’t need a keyboard. And how I don’t need a separate tablet cover when I tote it. The various keyboards available for the Levovo work fine for typing; they just aren’t as handy as the Surface keyboard design is. But I have gotten over that, and I never had a similar solution for the iPad anyway, which is my main comparison. One other “issue” is the Lenovo charges very slowly; it essentially takes all night to charge up from zero. Luckily, you’ll only need to charge it once a day, so again, not a big issue. The good news is it charges with a standard micro-USB cord (note, it takes an iPad-like 10-watt charger). I am a pen-computing lover—I love to take notes on a tablet and especially in OneNote, and the ThinkPad Tablet 2 has a good pen and the processor keeps up fine in OneNote. It’s much better than the capacitive touch pens an iPad uses, with ten times the resolution and fully automatic palm rejection. So this is another way it beats the iPad for my uses. And even if you do not take notes with a computer pen you’ll probably find, when in desktop mode in Windows 8 on a small tablet, that a pen is handy to hit the small buttons with (note, you cannot zoom the desktop or desktop apps in Windows 8). The Surface Pro has a good pen too, but that unit is too heavy to hold in one hand and write with the other. Also, the place to store the pen on the Surface Pro is lame—it magnetically locks into the empty power jack; you put it there when the power cord is not plugged in. But not only is that too unstable (the pen falls out too easily if knocked against), but due to short battery life I am always charging the Surface Pro and so the pen is mostly not attached. That means I have to remember to grab the pen off the table when I carry the tablet somewhere else, and I have forgotten to do that many times. The ThinkPad has a real pen slot that makes the pen safe and always available. By the way, if I have convinced you to get a ThinkPad Tablet 2, make sure you get the right model. There are a six or seven models out there. The lower cost ones come without the pen or corresponding built-in screen digitizer (while you can buy a pen, you cannot add the digitizer later). Some come with the non-Pro version of Windows 8 (RT style fewer features).So, really only one model is right in my opinion and it is number 367927U. Below is a table that lists the various models and their main varying specs, with model 367927U highlighted. Note by the way the second model from the bottom has a cellular broadband card, but it is an insanely expensive option in this tablet, and unfortunately it has no pen. [3/19 update: you can get broadband with pen if you configure on Lenovo website]. I am not going to review the ThinkPad Tablet 2 in any more detail than this. Here are links to some reviews and comparison videos for the ThinkPad Tablet 2 to give you all the gory details you need. So, yes, with the right hardware, Windows 8 Pro can be the basis of a near-perfect tablet—one that has all the battery life and even greater lightness of the iPad, and that can extend to full PC use when needed. 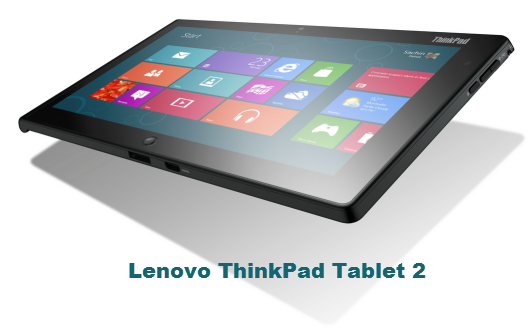 The Lenovo ThinkPad Tablet 2 gets you that now. The Lenovo has compromises of course. It’s not a full-powered PC and it doesn’t have a perfect keyboard cover. And as with all Windows tablets, it lacks tablet apps compared to the iPad. If any of that matters greatly to you, if you can wait a year or so, I think you’ll see better choices and better apps. I especially look forward to when newer Microsoft Surface devices can put the full Core i5 computer power and 10-hour battery life in a 1.3 pound Window 8 Pro tablet. Reports are that with newer low-voltage chip sets coming online, that solution may be arriving this year or next. But if you agree with my vision of a lightweight iPad-like Windows tablet, and you want something right now, this is the unit to get. Thanks for an excelent review. So are you saying that the Lenovo thinkpad 2 can use outlook like a PC? For example I have an ipad but I get frustrated with its limited MYN capacity, as I don’t use an external “tasks” app, just outlook. So on the ipad it is quite tricky (only has reminder list). So with a lenovo thinkpad can I get full MYN capability? You get full MYN, full Outlook. Note, you have to purchase Outlook separately. Outlook does not come pre-installed (nor does Office). THanks for your reply. Do you purchase Outlook as an app? Michael recommended a great app called TaskTask which is available for both iOS devices like your iPad, as well as a native Windows 8 app. Each version costs considerably less than Outlook and work beautifully. In fact, I think having the app allowed me to remain successful in the use of Michael’s system (the only system that has worked for me). The ability to whip out my iPhone or iPad (and now VivoTab Smart) and not only see my to do items but also add to (and manage) them the same way as in Outlook has been invaluable. I am not affiliated with the TaskTask app in any way other than I am a customer and think it made all the difference in using the MYN system when away from my desk. I want to switch from android but want to keep using Gmail and toodledo with a companion app. Like Tasktask. My reason for this are to use the other office apps and especially onenote with a pen AND synchronized audio recording. Can you comment on that combination? I’m especially interested in your experience with onenote’s recording feature which I think makes it a killer app. You can use Gmail and ToodleDo on this device (and on any PC). I agree, OneNote is a great app and I used it with sync audio in the past and it worked great. Great article! Just a quick clarification… all of the Lenovo Tablet 2 models come with the “full” version of Windows 8 – none of them have the “RT” version. The difference between Windows 8 and Windows 8 Pro is analogous to the difference between Windows 7 Home Basic and Windows 7 Home Premium. All of the Lenovo Tablet 2 versions can run “standard” PC software. The Pro version adds some additional networking, encryption and business tools. (Microsoft did not do themselves and favors with the confusing naming scheme!) See these sites for details: http://en.wikipedia.org/wiki/Windows_8_editions and http://www.dummies.com/how-to/content/the-four-versions-of-windows-8.html. Dave: thanks for that catch; I just edited the article to cross out that reference to RT. Glad to see the other models aren’t ‘disabled’ so much. Hi Michael. Great article. I actually bought your Tablet PC book back in 2004, and owned the same Motion Computing tablet you used–used at all day every dy for 6 years before it gave out. How would you compare the Surface and Lenovo to the Motion Tablet PC you used to use? Thanks. Glad to hear that book made a difference! The Surface and Lenovo are both superior machines compared to the Motion and can both be used as a Tablet PC. They are both lighter, but I obviously like the Lenovo better, and I bet it will feel just as fast as your old Motion (probably faster). I’ll have to second Michael’s recommendation. I also have the Tablet 2 and think it’s a great device. I’ve had a Tablet PC off and on since 2005 and, given its weight and battery life, this is the first one that begins to approximate a paper notebook. You’ll want to get the full version of OneNote 2013 (not the free OneNote app) as it has a number of subtle improvements over the app for navigation and pen input. I want to emphasize: the Tablet 2 is running full blown windows. Pretty much any Windows software from the last 20 years will run on it. When traveling, it’s great to have a device, that in addition to serving as a tablet, can run all of my regular desktop software. All in all, it’s a great laptop companion with a 10 hour battery life that allows me to read and mark up PDFs at my leisure, and in a pinch, even launch Matlab. Years ago, I had a Psion series 5mx PDA. It had a clamshell case with a keyboard I could type on, and weighed less than a pound. In addition, it had Word- and Excel- compatible software, contacts that would sync with Outlook, infrared printing and syncing capability, and cost about $400. I have been trying to replace it ever since. Do you know of a tablet with a keyboard (or with a third party keyboard) that runs MS Office and weighs less than one pound? I want something with MS Office that is light enough to keep in my handbag all day. If no such item exists, is there an under-one-pound tablet plus keyboard that has Office-compatible software? Also, what to you think of Dragon Naturally Speaking 12? Would that serve as a viable keyboard alternative on the go? If you could write a comprehensive article about how best to accomplish mobile business tasks (tracking receipt and business card content, writing documents, creating spreadsheets, etc.) other business professionals and I would find it incredibly useful. I’d like to know the best current hardware and software to use for a variety of tasks. It appears this is a full Windows machine so should run everything including running Outlook (not just syncing with it). 2) Dragon Naturally Speaking 12: I am using it now and it works quite well. However it’s not like an iPhone or Android where the microphone button is next to each text input spot; you need use hotkeys or click a separate application to engage and unengage it, so it feels a bit more clumsy. But for long documents it is indispensable and very accurate. 3) You know, each person’s life and work needs are so different it’s hard to be comprehensive. But if I see something I think can work in multiple workflows you’ll see it in the blog. You may want to scan the old blog contents, you may find something there! Michael, do you have an opinion about Samsung Series 5 Slate? It appears to be very similar to Lenovo (digitizer pen, 9 hours battery life, Win 8 Pro, same RAM, CPU & storage, etc. ), but the screen is even bigger (11.6″ instead of 10.1″). No we have not studied it. Looks good on paper, slightly heavier than the Lenovo, but all else looks good to me. let us know how it goes if you get it. At last! Someone writing about tablets who thinks that Outlook matters. I feared that I was the only, but you make the Outlook point in your very first paragraph and repeat it several times. Thank you. I need soon to be weaned off my Psion, on which I rely for the pitch up and go -ability and light work for which you use tablets. The ThinkPad at 10 inches is a bit on the big size. Psion Netbook’s 7½ screen s quite big enough for my 70 something year old eyes and, as a tablet, would just about fit a jacket pocket. Microsoft will soon release a 7 inch version of it’s Window 8 tablets. May be just what you need. Thanks for all the great productivity articles and books! I use Outlook and MYN (but am struggling to keep by task list <20 tasks!). What are your thoughts on the Lenovo ThinkPad Helix? Seems to combine the best of both worlds: laptop clamshell with a detachable tablet. The Helix tablet is a little larger and heavier than than the Tablet 2 specs above. Also comes configured with Intel Core I5/7 instead of Atom procesor, so looks like you'll get better performance but lower battery life (6 hours vs. 10 hours for Tablet 2). I'm OK with the cost if I can combine a decent business laptop with a usable tablet that meets your "true tablet" criteria. What say you—is this a "true tablet"? I hope these thoughts help somewhat! Can you run Clearcontext on the Lenovo thinkpad 2? What about Office for the Ipad? Anton, as you probably know Office for the iPad came out long after this post was written, which is why we didn’t mention it in this article. As an update, then, here are my thoughts. First, you probably know Office for the iPad does not include Outlook, and the main reason a Window tablet is still my main pick for a productivity tablet is because it runs a full desktop version of Outlook–something I highly recommend for MYN users. That said, there are other options for MYN tasks like Toodledo, and so using Toodledo on an iPad with Office for iPad could be a great combination. I’d give it a try. However, if you need the high-end features of Office Word, Excel, PowerPoint, etc, you also probably know that these modules in Office for iPad are feature-disabled compared to Windows Office, and so may not have the power you need. The level of Office for iPad features sit somewhere between a smartphone version and the Windows desktop version of Office. May or may not work for you.